Built with the casual motorcyclist in mind (think moto-guzzi, scooter rider), the REV'IT! CR Textile Jacket brings a vintage style to adorn the protection of a motorcycle jacket. It's a brand new REV'IT! offering that dropped in Spring 2010. Featuring a protective REV'IT! polycotton Powershell with Lorica reinforcements and Knox CE rated armor with an upgradeable backpad, the REV'IT! CR does not lack in the protective department. REV'IT! added a light coating to the outside of the shell, giving the jacket a matte finish that looks dynamite on or off the bike. The jacket also features a detachable thermal bodywarmer vest and a very comfortable mesh liner, that feels fine being worn on bare skin. We see this as a great option for the casual scooter or moto-guzzi rider or the rider looking for a retro-styled protective jacket. The CR is also available as women's textile jacket, a women's leather jacket, and a men's leather jacket. Check out other REV'IT! 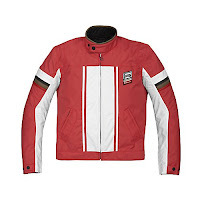 textile jackets and the full lineup of textile motorcycle jackets that we carry at RevZilla.